Hamish Mackie was born in 1973 and grew up on a farm in Cornwall. He is largely a self-taught sculptor, though he began sculpting whilst still at Radley College and then went on to study Furniture and Product Design at Falmouth College of Art. His sculpting career took off in 1996 and he has established himself as one of the top wildlife sculptors in the UK today. He draws his inspiration from the natural world and he prefers to study animals in their natural environment and has been known to begin a clay model of an animal in situ. His method is loose, fast and energetic resulting in his capturing the power and movement of his subject. He loves to experiment with texture, and works initially in clay, wax or plaster of Paris, and often leaves a history in the surface as to how it was made. Whether it is his palm pushed into a cheetah’s leg, the craggy texture of a stag, or the delicate feathering on his snipe, there is always a link to his subjects. His work ranges from incredibly loose energised sculpture to almost obsessive tightness but he never loses the anatomical proportion and form of the subject concerned. 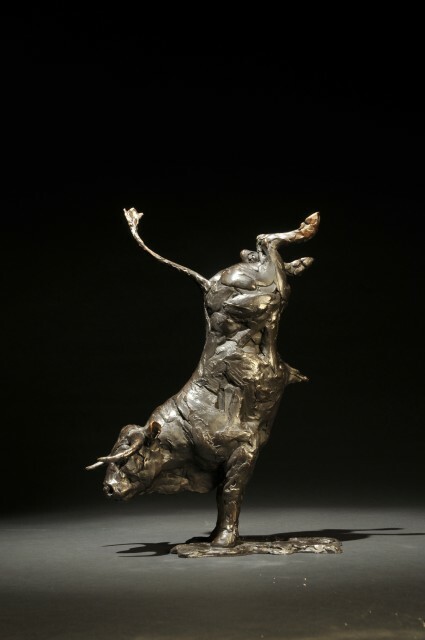 The vigour and energy Hamish creates in his work contrasts with the solidity of bronze and the outcome is both dramatic and powerful. He is a member of the Royal British Sculptural Society and has work in collections in the UK and worldwide. He lives in Oxfordshire with his wife and children.